By Chewang Ngokhang (Southern California). Yes, MWA or the Middle Way Approach is the worst form of proposal on the table except for the rest. Some of you will be able to know where I am coming from. Today, many youth in China are lamenting that Beijing is not doing enough in spreading its influence in the hinterlands as well as in the Pacific sea. Hence, she is flexing her muscles in the South China and East China Seas making several countries in the vicinity feeling jittery. In light of these developments MWA stands out as the best proposal that is beneficial to both the entities. By 2020 China will be closer to having a 2020 vision and subsequently, MWA will have a chance since many of its intellectuals, scholars, students already understand the reasonable and resilient proposal. Of course, being Gangchenpa (Tibetan) we all dream of Rangzen which is our birthright, and we do have a strong case seeking it in a conducive ambiance in the international arena, but if Rangzen is only a fleeting mirage in today’s political juggernaut, then the next best thing is Rangkyong or MWAwhich is mutually beneficial to both entities, and proceed just like Ireland and Scotland under the Union umbrella. I am fully cognizant of the fact that some of our Rangzen advocates are well educated in western universities, but I am not sure how well they are educated in our Tibetan history and our way of life. I was born in Tibet, schooled there under the old system and later the CCP’s way, taking part during the Great Leap Forward of the late ’50s, and finally escaping to the free world and landed at Kalimpong in spring of 1961, where I attended St. Augustine’s school. Being the school Head Prefect as appointed by father Hofstetter, I passed the Senior Cambridge Examinations in 1969. Then living in Southern California since October 6, 1971 and studied at University of Redlands, where I had majored in international relations and minored in food service. After graduation my student visa expired and soon my survival necessities took precedence over furthering my academic program. Consequently, I got into the KFC enterprises as silent partner with profit sharing as I accentuated my expertise in the field of food service and management. I shouldered the responsibilities of running the operations of seven KFC stores for a period of eighteen years, till I retired in my late forties on August 20, 1997. While I was at U of R I was honored to receive a letter of invitation from President Dawson at the recommendations Dr.William J. Klausner, Chairman of the Commission, and Dr. Raymond H. Whitmus, vice President for students to serve as member of President’s Commission on Human Relations on the campus which I accepted with alacrity. In addition to this, I was also the President of International Club with 100% votes from the international students. I had also worked at the Bureau of H.H. the Dalai Lama, New Delhi under the late Representative Thubten Nyinje Chog from May 1970 till October 4, 1971, in my capacity dealing with applications from our folks for IC, permits, visas, etc. In Southern California I was with the Orange county Tibetan students group mainly in the late ’70s, one of the three Directors in the Tibetan Kyidhuk and the first Tsogtso (President) of the Tibetan Association of Southern California, formally incepted on September 16, 1993.
always recite that the gate for dialogue is wide open, but once we enter the open gate we face the impenetrable Great Wall of China. This Great Wall has also become our own Wailing Wall for justice. May I side track a little here and touch on the 2008 delegation to Beijing. It is my understanding that during the session our delegates were subjected to harsh words and scolding from the other side. This isn’t anything new, but I had observed something odd looking at the picture of our delegates from both sides in a very formal setting with suits and ties. What made me feel a little embarrassed was that one of our delegates was wearing white socks which was starkly visible to a naked eye. White socks with formal suits and ties is absolutely no no in a formal diplomatic setting. It’s against etiquette of decorum. No wonder they call us barbarians. So, please beware. Do you realize that all of us in diaspora could be seated in the mega football stadiums in Mexico City, Sao Paulo or Rio de Janeiro? That’s all we have, and yet we have a multitude of NGOs under all sorts of sensational names, and some even beating the rangzen drum furiously as if Kundun hasn’t done enough or making a huge mistake for settling for less. This is preposterous, and it irks me. 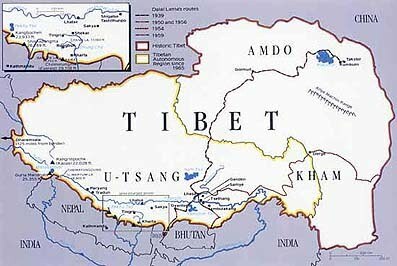 Now, the newly formed TNC is glorifying the deeds of the 13th Dalai Lama and his proclamation of Tibet’s Independence. Surely, the 13th Kundun did proclaim Tibet’s independence in 1913 but in no way did he ever say that he had endeavored for it and got independence. I am also happy to learn of late on Phayul an interview of Lhadon Tethong and TYC’s President Mr. Tsewang Rigzin. Mr. Rigzin has tempered his rhetoric a lot by stating if we sought rangzen, then we might have a better chance of acquiring rangkyong. This statement exudes his gumption and I accept it with delight. The metaphor Tag chu chepe zing bhu could mean the dethroning of the Manchu emperor by the Han Chinese under the leadership of Dr. Sun Yat Sun during the Xinhai Revolution in 1911. And, the Chinese rightly claim that was a gift from the Chinese people to Tibet. To that I say darn right! Today,tag chu chepe zing bhu is nowhere in sight. But, I surely see a tag chu barwe xing chen; everoverflowing water’s huge pond. This scenario is visible across the globe whether we like it not; it’s a fact. Therefore, it is delusional to clamor for rangzen at a time when powerful China is soon to surpass the United States in GDP. In addition to being US’s biggest creditor, China and the United States are inextricably intertwined in economic venture, a vision so sagaciously cultivated by Richard Nixon and Dr. Kissinger in their efforts to thwart Soviet expansionism and bring peace in the world. So profound, so brilliant and so farsighted. Today I see some of our youths beating the rangzen drum aimlessly without much knowledge of our history, let alone the world history. I came across a mature rangzen advocate who truthfully admitted to me that he didn’t know anything about the name Shigatse when I had mentioned the name. If he didn’t know anything about Shigatse then it’s reasonable to assume he didn’t know anything about Drophagkhamsum or Repangsasum in relationship to our history during the reign of the 13th and 14th Dalai Lamas respectively. The point I am trying to make here is that our youth need to educate themselves on Tibet, its history and with a degree of understanding of our neighboring countries’ history, if not world history; and put our struggle in a correct perspective in realizing a free Tibet. I have also come across articles from some apologists for Tibet who claim that the 13th Dalai Lama and his administration had thrown the Chinese out of Tibet in 1912 and proclaimed Tibet’s Independence in 1913. It’s true there were some minor skirmishes between the Tibetans and Chinese, but by and large the Chinese were given stipend, ration and transportation to go back to China or India. It was also mentioned about the Lingthur incident in Sikkimese territory under British jurisdiction in the 19th century, when Tibetans had ransacked the British outpost there, as if we Tibetans had done something very resplendent. That wasn’t the case those days when our army was only in name with some levies and conscripts with muskets, swords and spears. That was it. Why distort information like the other propagandists. According to a Rangzen advocate, a British army officer in Darjeeling had written that the Tibetans had come within some 65 miles to Darjeeling in the 19th century, after sacking a British outpost at Lingthur in Sikkimese territory, and the locals in Darjeeling were panic stricken. I believe that was purely malarkey. He knew how could our ragtag army ever challenge the might of Great Britain at a time when its power was at the zenith, and the sun never set on the British empire on ever revolving earth. I believe he was connivingly trying to justify his severe retaliatory action, when the Tibetans were so soundly beaten that our levies found themselves fleeing helter-skelter, and found themselves in Hah and Padro valley in Bhutan. His prior justification was understandable when the Londoners poured out in force in the streets protesting for butchering innocent Tibetans in the massacre at Chumi Shingo in March 1904. I am quite familiar with these episodes because my birthplace (Phari) is in the vicinity. Also, to embellish my point of view, my grandfather was one of the four Drongrak Magmies (soldiers) stationed at Phari and Dromo in the 1930s and 40s. From him I had learned a lot about the Younghusband intrusion to Tibet although he must have been only a young boy at the time. Napoleon Bonaparte had said that a good spy is worth 10,000 soldiers in the battle field. The English claimed there was no need of spies during their incursion to Tibet when our people put up stiff resistance against the onslaught of the foreign marchers to Lhasa. The British knew precisely when they would be attacked and when there wouldn’t be any attacks so that they could relax in the sun, wash clothings, and search for rare species of butterflies, study the topography and what not. Their predictions came from our lunar calendars. Auspicious days meant attacks and inauspicious (chutsak) days meant no attacks at all. Incidentally, their Captain O’Connors was proficient in Tibetan both spoken and written. Well, that was then and this now. Today, I see many young Gangchenpas fairly well educated and very patriotic toward our mayul (motherland), which is invigorating but at the same time I caution them not to act rashly because little knowledge is a dangerous thing. Surely, there may be a few neoconservatives in the west loathing the communist government, and giving us some support but I say to you all to trust the Dalai Lama and the MWA. We had some covert support from the west during the late ’50s till the early ’70s without the knowledge of Kundun since it was engineered by a few rangzen advocates in Kailimpong and Darjeeling. Then it was all over just like that in tune with saying easy come easy go. Bela bhim bela boom! We were used.